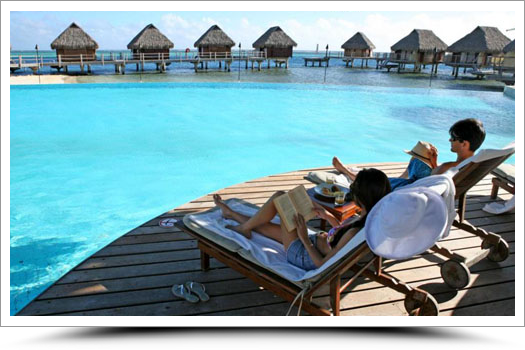 Nestled between two bays on the heart-shaped island of Moorea, just 17km across the Sea of Moons from Tahiti’s capital Papeete, the Hilton Moorea Lagoon Resort & Spa is set against a stunning mountain backdrop which melts into a crystal clear lagoon. The unspoilt beauty of this verdant paradise, also known as the ‘Island of Love’, was the inspiration for many works by French Impressionist, Paul Gauguin. Featuring contemporary Polynesian design, this Moorea resort’s luxurious bungalows are set amidst exotic flower gardens or suspended above the turquoise lagoon, teeming with tropical marine life. Sample Polynesian and international cuisine from a choice of themed menus, buffets and delicious à la carte dishes. The islands only all bungalow resort set in a great central location. Snorkelling fans will love the fish and coral you can see right from the beach or your overwater bungalow. 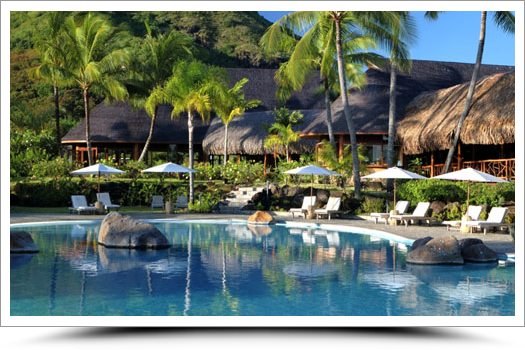 Located on the northwest coast of the island and sheltered from the prevailing winds, the InterContinental Moorea Resort & Spa stretches luxuriously between mountains and lagoon, in the heart of an 11-hectare green space housing nearly 200 different plant species. In this exceptional setting where deep greens and brilliant blues rival one another’s intensity, the InterContinental Moorea Resort & Spa offers you an immersion in a true tropical paradise. The concierges will help make your stay unforgettable: they will show you the sports and cultural activities of the hotel and the island, hidden areas and unexplored places, craft stores not to miss, and the Polynesian culture. On Moorea , the most beautiful island in the Pacific and the closest to Tahiti (8 minutes by air or 30 minutes by catamaran), the Hotel “Les Tipaniers” awaits the nature lovers who appreciate the beauty and authenticity of this little Paradise . 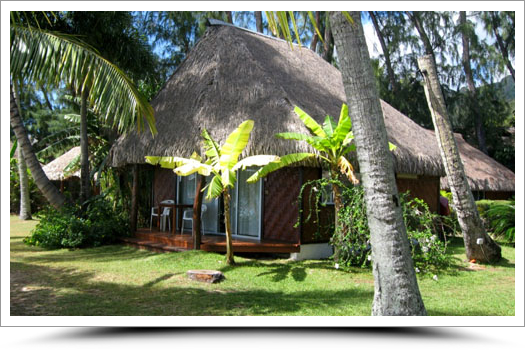 Basic but clean bungalows are located in a beautiful setting on the island with a gorgeous white sand beach. Not a resort for everyone, but if you are on a tight budget this may be an option to help get you to French Polynesia – the location is beautiful. The hotel is built on the grounds of the first hotel built on the island, the Bali Hai. In 1961, three young Californians, inspired by Polynesia, created a mythical hotel. The “Bali Hai Boys,” as they were known, continued on to build a hotel in Raiatea in 1966 where they invented the overwater bungalow. The Manava Beach Resort & Spa (formerly the Pearl Beach Resort & Spa) features three stone tiki sculptures (mythical fitures of Polynesia) that honor the rich Polynesian culture and traditions. The sculptures guard over the lobby area, the garden and the pool. This charming “boutique” hotel is a perfect blend of luxury and serenity making it an ideal destination for couples, honeymooners, divers and families. Manava Beach Resort & Spa offers garden bungalows with private plunge pool, but guests may also enjoy the clear water of our infinity swimming pool, the largest one of the island. This resort has a wide variety of accommodations including some garden bungalows with their own plunge pools. Some excellent snorkelling right off the overwater bungalows. 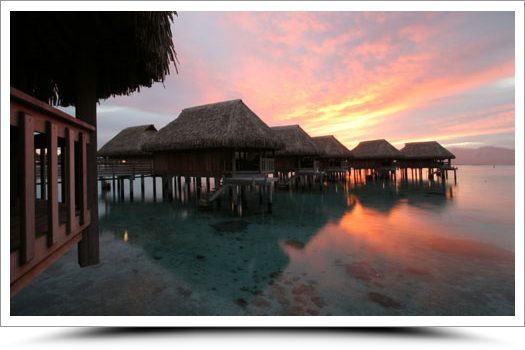 Sofitel Moorea la Ora Beach Resort is settled on the edge of a magnificent lagoon, with views over the island of Tahiti. The resort, recently renovated, features 114 luxurious bungalows built over the water, on the beachfront or surrounded by landscapedgardens. Facilities include two excellent restaurants, a bar, a fabulous outdoor swimming pool and day spa. Moorea has one of the worlds most beautiful beaches and a variety of motorized and non-motorized water activities can be arranged for guests. Benefiting from naturally beautiful surroundings, Sofitel Moorea is ultra-modern and enjoys a spectacular location on the most beautiful, white sandy beach on Moorea. 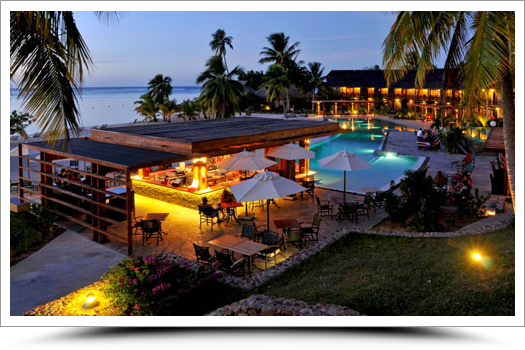 Enjoy exceptional cuisine and elegant presentation at the resort’s restaurant K.
One of my favourite resorts on Moorea, if you are a beach lover this one is for you set on the best beach on the island. Carl Henderson is a world traveller and professional travel advisor with a passion for designing exotic vacations to Tahiti and her islands. Sign up to get interesting news, Tahiti specials and updates delivered to your inbox from Tahiti by Carl.